“Illinois, Cook County, Obituaries, ca. 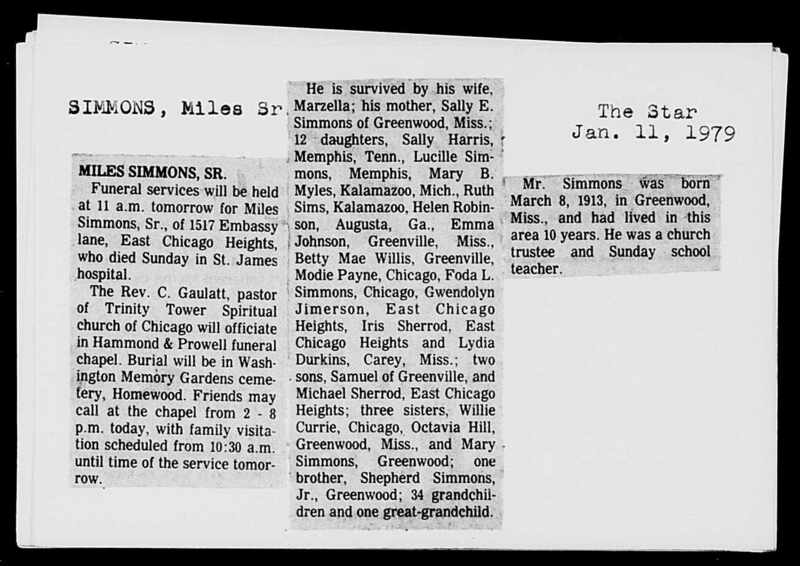 1970-1990,” database with images, Miles Simmons Sr, 1979; citing Cook, Illinois, United States, South Suburban Genealogical and Historical Society, South Holland; FHL microfilm 1,907,511. “United States Census, 1940,” database with images, FamilySearch(https://familysearch.org/ark:/61903/1:1:KQVM-ZTC : accessed 18 September 2016), L R Washington, Wilmot, Wilmot Township, Ashley, Arkansas, United States; citing enumeration district (ED) 2-27, sheet 5A, family 88, Sixteenth Census of the United States, 1940, NARA digital publication T627. Records of the Bureau of the Census, 1790 – 2007, RG 29. Washington, D.C.: National Archives and Records Administration, 2012, roll 117.